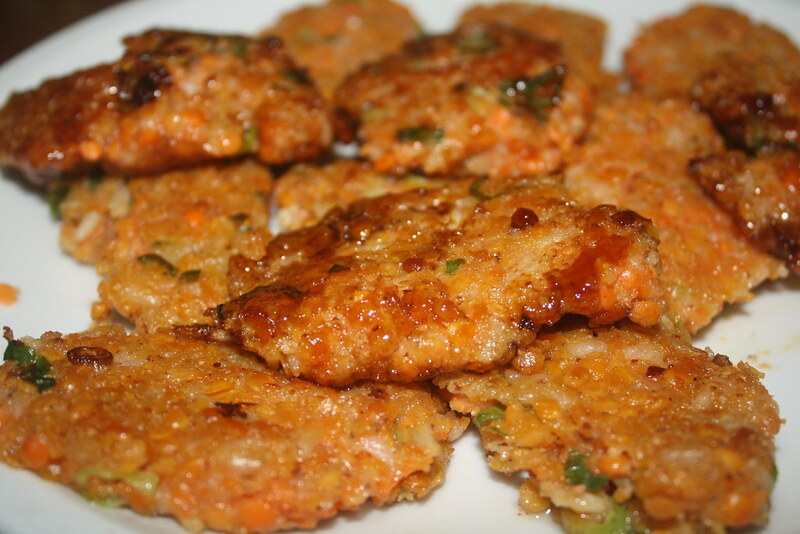 Recipe: Red Lentil and Rice Burger – deutsch, bitte! In our continuing quest for easy and delicious vegan burgers, last week we tried out another recipe, which has probably been the easiest one to date: red lentil and rice burgers. After a quick search, I found the recipe on Salt and Paprika and it seemed like a relatively simple and easily modified recipe. And it was! This recipe was super simple to make, and even though we made some modifications, all were easy. First, I doubled the recipe because we figured that we would eat everything as leftovers (which we did, for about a week, as the mixture stores well in the fridge and is easily fried up). We also used spring onions instead of chives due to a translation miscommunication when I sent M. shopping, but they were still tasty. Finally, the mixture in the initial recipe was somewhat bland so we added spices to make a flavour we liked, which is up to the discretion of each individual. But we both agreed that the patties on their own were lacking in any kind of kick. 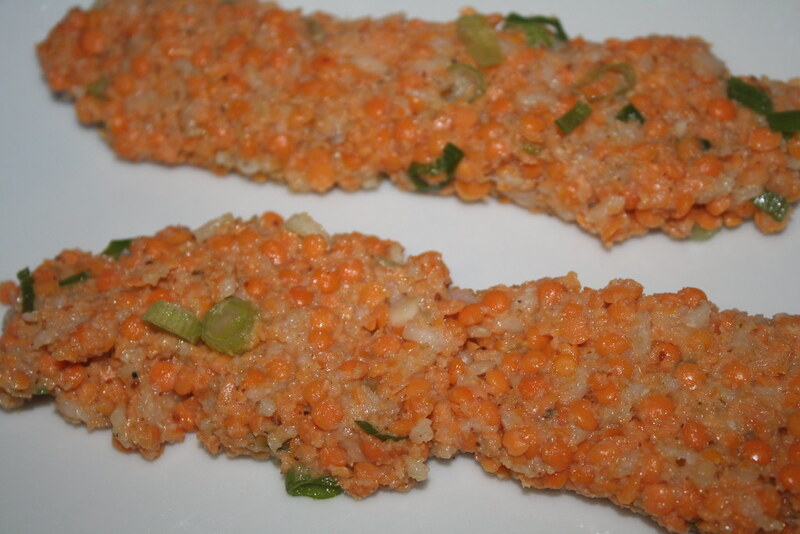 -Place 2 cups dry red lentils in a bowl and cover with 2 cups boiling water. Cover and set aside. -Prepare 1 cup dry rice as directed. 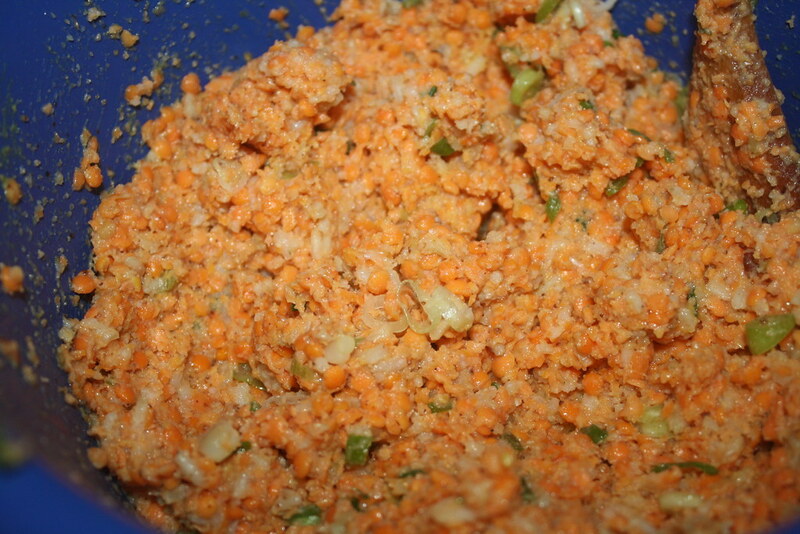 -Drain the lentils, them combine them in a food processor with the rice, 1 bunch of spring onions (or chives), sweet mustard, regular mustard, chili flakes, and salt and pepper to taste. Mix until the consistency is sticky. -Shape patties as desired. Fry them in an oiled pan on medium high heat, flipping to ensure both sides are golden and crispy.